Ever wondered how to roast asparagus? 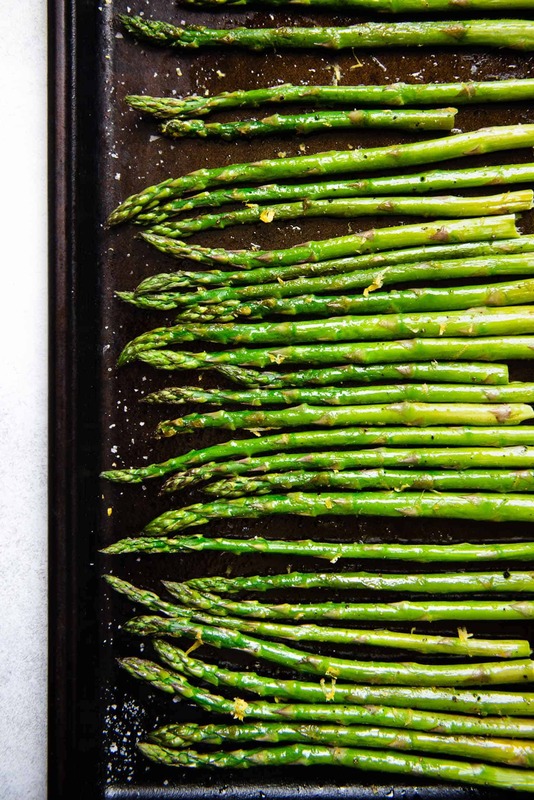 Here’s a simple oven roasted asparagus recipe that uses just 5 ingredients: asparagus, olive oil, salt, pepper, and lemon zest. The roasted asparagus is great with my sticky Asian chicken thighs, butternut squash mac and cheese, or vegetarian shepherd’s pie. 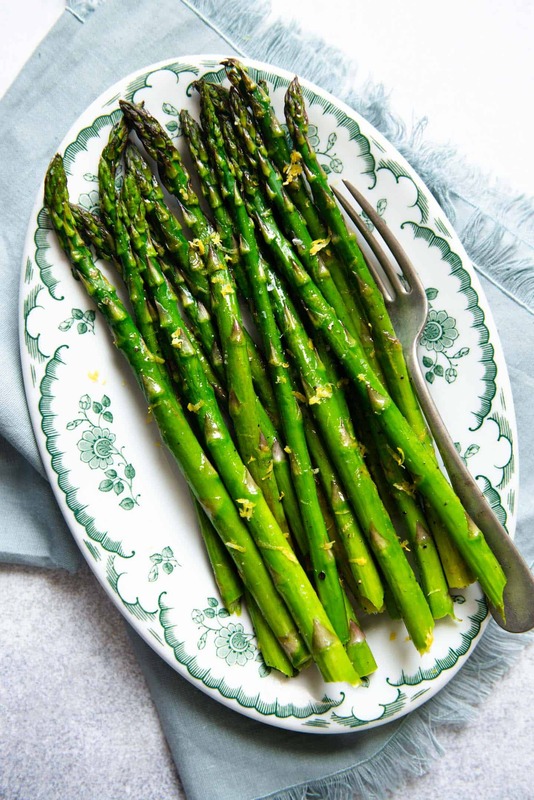 One of my favorite springtime dishes is oven roasted asparagus. It tastes fresh and takes only 15 minutes to make. I often serve the roasted asparagus with another oven roasted dish, like my sticky chicken thighs or roasted salmon. Lately, I’ve been serving the asparagus with pizza. I’ve got to sneak in those vegetables somehow! Roasted asparagus is truly a versatile side dish. 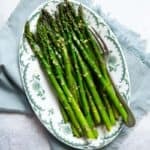 If you look up roasted asparagus recipes, you’ll find there are a lot of variations in terms of oven temperature and cooking time. In general, I roast asparagus at 400ºF because the number is easy to remember and it’s a good temperature to maintain if I’m cooking something else in the oven. I keep the seasonings simple: good quality olive oil, salt and pepper. Then, I spread the asparagus onto a baking sheet in single layer before popping the entire sheet into the oven. I cook the asparagus quickly, 8 to 9 minutes, because I prefer the spears to be juicy and crisp. Nothing bothers me more than overcooked asparagus. If I leave the asparagus in the oven longer, the insides of the spears will turn soft and mushy. The skin will also wrinkle, giving the spears a slightly stringy quality. Keep in mind that I tend to roast asparagus that are medium in thickness, about 1/2 inch in diameter at the base. If you are roasting thicker spears, leave them in the oven slightly longer, about 10 to 12 minutes. Finally, I finish the cooking by tossing the roasted asparagus with lemon zest to add a subtle bright flavor to the dish. Selecting the right bunch of asparagus is just as important as nailing the roasting time. When I’m picking out a bunch of asparagus, the first thing I look for is the size of the spear. I pick ones that are medium thick—not the ones that are thin like a pencil or ones that are chunky. I want them at about 1/2 inch in diameter. Next, I look at the ends of the spears. I want to avoid bunches with spears that have dry and woody sections. After selecting a fresh bunch of asparagus, I’m ready to take them home. I always snap the ends of the asparagus before roasting. 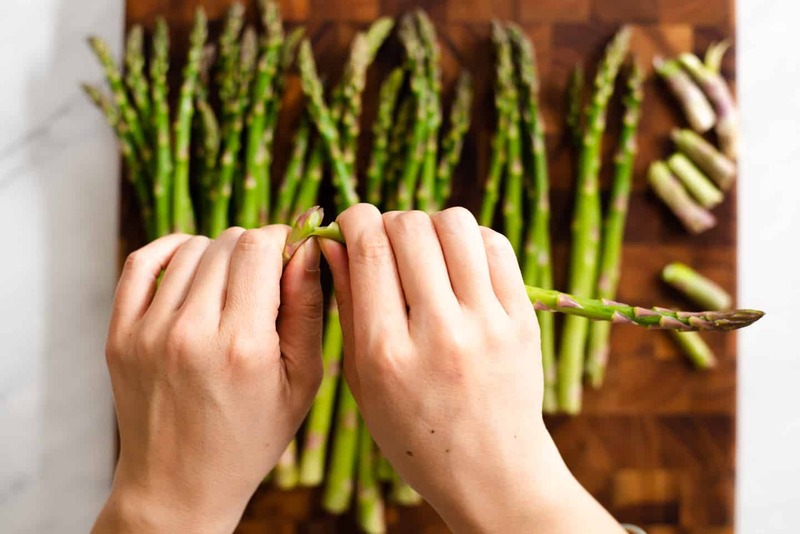 As I learned from Ted Allen on an episode of Queer Eye years ago, each asparagus spear has a natural snapping point. If the spear is very fresh, I snap off very little from the end. However, if the ends are looking dry and woody, I’ll snap more off the bottom. 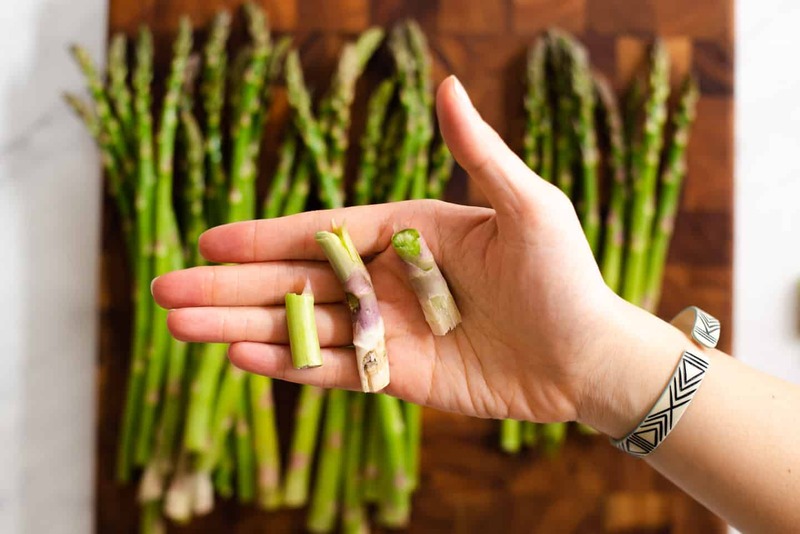 Even if you are snapping asparagus from the same bunch, some will snap more easily than others. Note: This post was originally published in March 2014. It was one of my first recipes on this site and desperately needed a makeover. I simplified the recipe and added snazzier photos!